I bought a couple of books today. The first is about the Swedish author Gustav Hedenvind-Eriksson (1880-1967) by Örjan Lindberger. I hadn’t a clue who he was but I was attracted by the rune stone on the book cover. 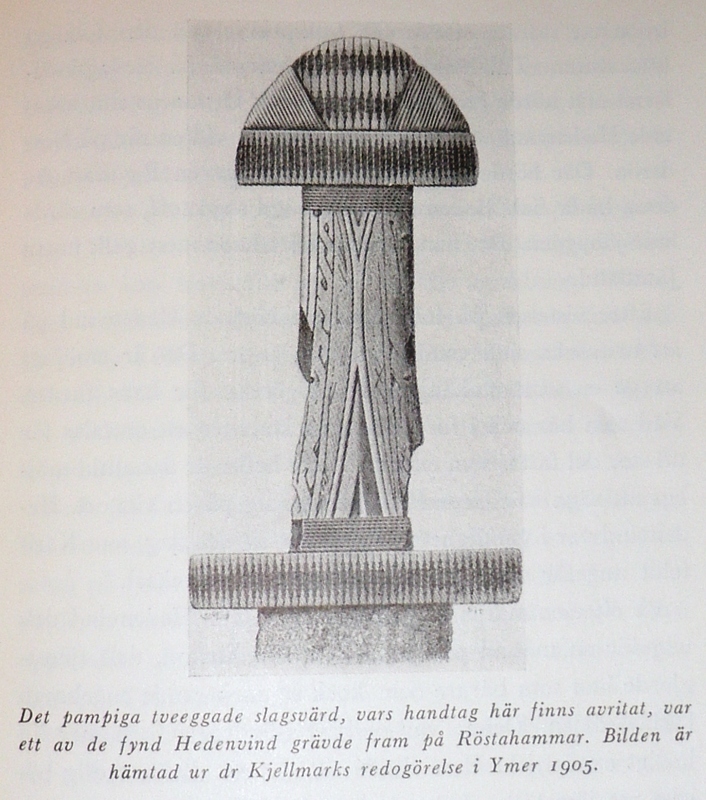 I flipped through the pages and found another picture that caught my eye, a picture of a Viking age sword handle and scanned the closet pages – concerning an archaeological excavation he participated in under dr Knut Kjellmark (1866-1944) of Viking Age graves at Röstahammar, Jämtland. As the price was 5 sek (ca 0,75 US $ or 0,60 €) there really wasn’t much to talk about. As I got back I googled Hedenvind-Eriksson and found that there is a Hedenvind society (Hedenvind-sällskapet) that had lots information on him and his life. 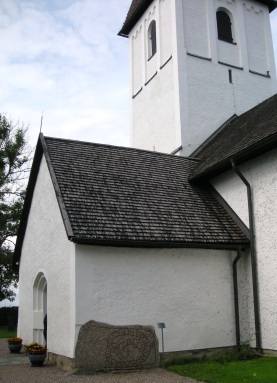 Hedenvind was born in the village Gubbhögen in Alanäs parish in the northern parts of Jamtland. He didn’t get much schooling and left his home at the age of 15 to work as a lumberjack, as a rafter, as a navvy, as a sailor etc. 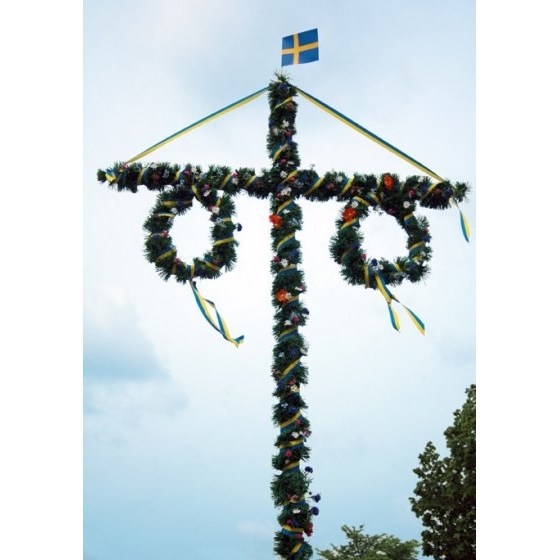 In 1903 he got the chance to get back to school, at a folk high school, near Östersund called Birka. At the time archaeologist dr Knut Kjellmark, perhaps best known for his work in Småland (in southern parts Sweden), worked as teacher in History and in 1904 he let Hedenvind be part of the excavation of a Viking Age grave field in Röstahammar, the results are described in Ymer 1905. 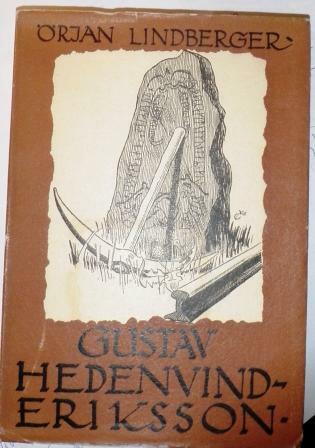 Hedenvind was inspired of this as an author which can be read in works such as Järnets gåta (the mystery of iron) and Jämtländska sagor (sagas from Jamtland) (1941). Hedenvind first book was published in 1910; Ur en fallen skog (From a felt forest) he was one of the pioneers in Swedish autodidact working class authors and was a big influence on coming authors in the genre. He mixed realism and myths to a writing style of his own where he often describes the situations for navvys and their life, several novels concerns Jamtland and the northern parts of Sweden, about the forests and about forestry. Some of his better known later works, include a book I actually own and have read Jorms saga (1949), and Jämtändska sagor (1941), Sagofolket som kom bort (the people of the sagas that was lost) (1946) and Gismus jägares saga (the saga of the hunter Gismus) (1959). In these books he takes a starting point in stories he remembered from his childhood, existential questions such as religion and culture. It’s often said that you should judge a book by its cover, and mostly I agree with that statement, but sometimes the cover gives you just enough to catch your eye which might lead to an interesting adventure or to new knowledge. In this I learned something new and I feel that a walk to library is in order to read up on some of his work. I’m not sure but it’s possible that some of his works is translated to English, I think I’ve seen Jorm’s saga in English somewhere for example. For another fiver I got Sten Bergman’s (1895 – 1975) Min far är kannibal from 1959 published in English in 1961 under the title My Father Is A Cannibal. 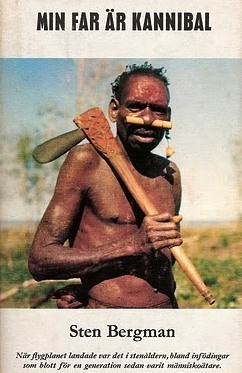 This book concerns one of his scientific journeys to Papua New Guinea in 1956, where he and his wife were adopted by the Cannibal Chief, Pinim, and his wife, Akintjes, in a dramatic ceremony. In the book he describes the nature and animals he studied such as the tree kangaroos and the forest turkey. During his stay he kept company with the native Papuans which he describes as primitive and still living a Stone Age kind of life and being cannibals. I read parts of this book several years ago and there are things that can be said of the descriptions of the Papuans, though one has to read them in their historic context. If I remember it correctly it was an enthralling read, we’ll see what I think of it today. 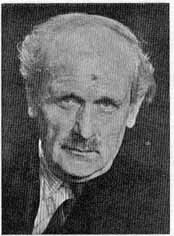 Sten Bergman was a Swedish biologist and zoologist and is perhaps best known for his expeditions to Kamtchatka 1920-23, The Kuril Islands 1929-30, Korea 1935-36 and Papua New Guinea 1948-50, 1952-53 och 1956-59. More can be read on the website Sten Bergman Upptäcktsresor i bild (Pictures from expedition), in Swedish but with great photos. On the website a project regarding Sten Bergman’s travels and research is presented with the aim of making a documentary, a book and an exhibition with his photos. I’ll keep a look out on what’s happening about that and write a few words on the book. 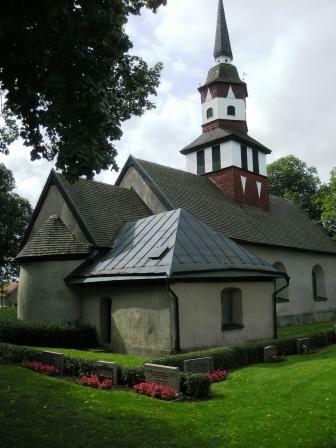 Three medieval churches, two rune stones and a mound. I haven’t been lazy I just haven’t had access to the internet the last few days. I arrived in Luleå late Sunday night after a 10 hour drive and has since been working on an excavation, more on that later on. Consequently I will publish three post today of which this is the first. Saturday I spent in Linköping with my fiancée, we took a drive in the countryside to watch some churches and rune stones, and we scored gold. 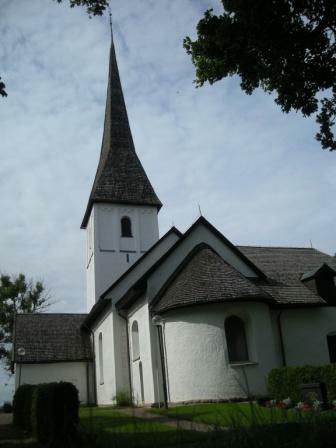 Our first stop was Ledberg church, the church is built during the 19th century on the place where the medieval one once stood. 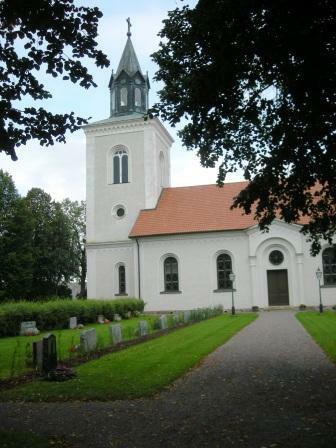 So the church itself isn’t all that interesting but ca 100 meter south of the church is a great mound called Ledbergs kulle (hill). 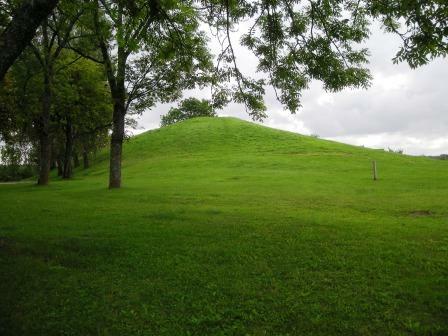 The mound is the biggest one in Östergötland and it is probably built during the Iron Age (ca 800-1050 AD) but might be as old as from the 6th century AD. 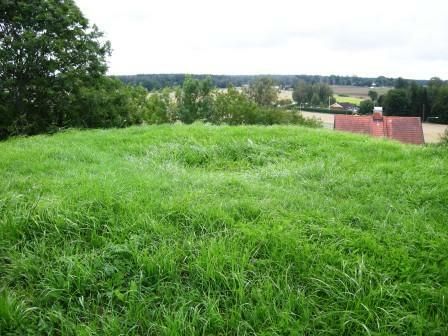 As you can see the top is a bit flat, as one climbs the mound one can see a small fördjupning at the top and of course the great view. At the information sign I learned that there was a rune stone by the church at the cemetery. 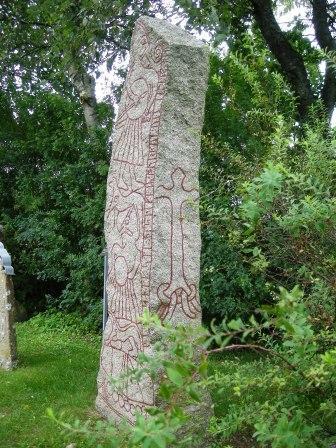 I have to say that the lack of information signs showing where there are rune stones in Östergötland are really crappy. 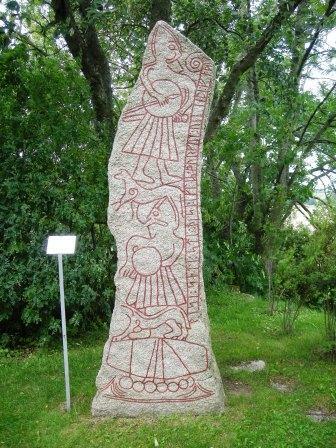 At several stones there is nothing that gives it away, here it is mentioned on a information sign regarding another monument, and this rune stone, Ög 181, is a real gem with carvings (images) from the Old Norse mythology. 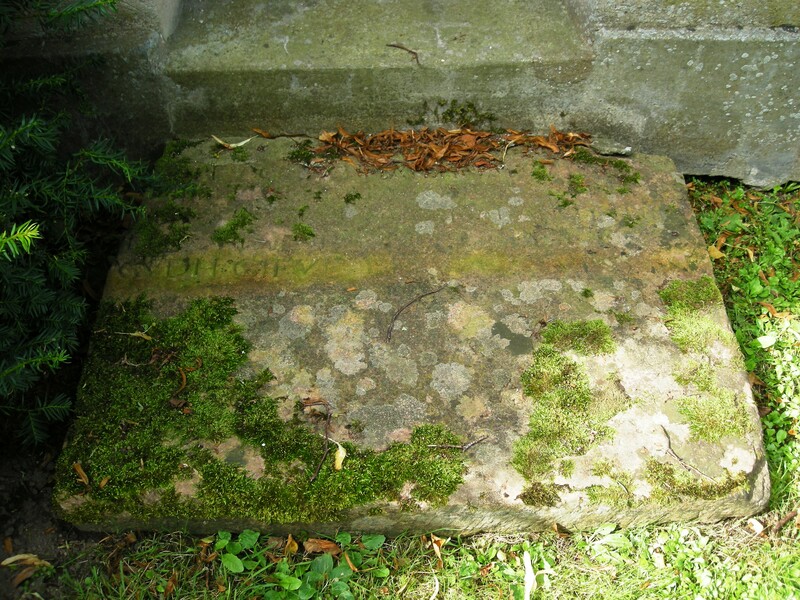 Translated into English; Bisi placed this stone in memory of Þorgautr … his father. Translated into English; And Gunna, both. Thistle, mistletoe, casket. The last part has been interpreted as a spell or curse. The pictures have been interpreted as images from the story of Ragnarök. 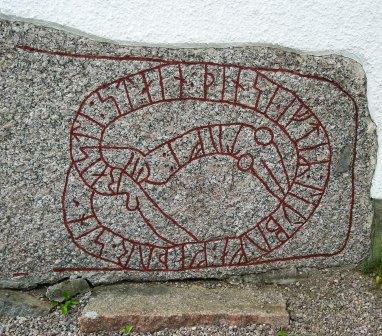 On the backside is an image of Fenrisulven, the brother of Midgårdsormen, biting Odin in his foot. At this sign I would expect an information sign with a bit more information than is available today, there information is very basic and only in Swedish, this one deserves more. After this visit we went on to Björkeberg church, a very pretty church with a lovely small absid. A thought that ran trough my head was that the small kor and the absid have the size of a stave church and that this possibly was the first Romanesque church and that the ship was built later on. 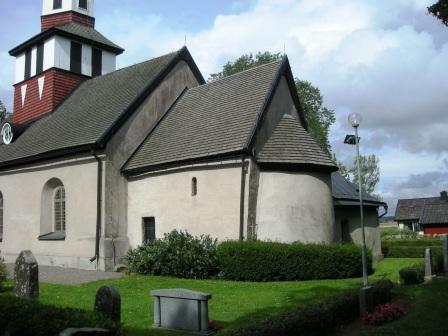 At this point another negative comment; I miss information signs about the medieval churches in Östergötland like the ones in for example Kronobergs County. 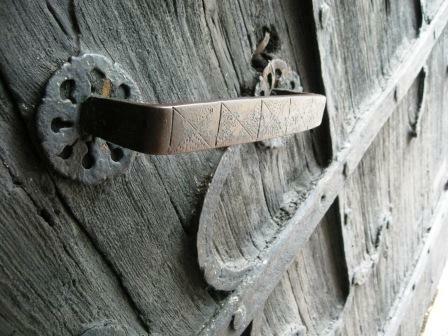 At the doorstep of one to the small door to the sacristy an old grave stone has been reused a gotten a new function. The church was not open for visitors so we couldn’t see the inside. The next and last stop was another gem; Kaga church and it was open for visitors. The oldest parts of Kaga church are from the 12th century, this includes the tower and the main building. The south entrance room was added in the 17th century and the sacristy in the 18th century. A walled in rune stone, Ög 103, can be found in one of the outer walls. There’s no road pointer for this one either. 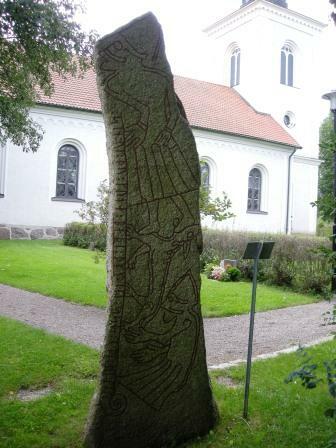 Another rune stone has been found here but is now placed in the public library at Linköping. Translated into English; Tófi raised this stone in memory of Lið-Bófi, his father. Well inside the church we was amazed by the beautiful paintings and relics. 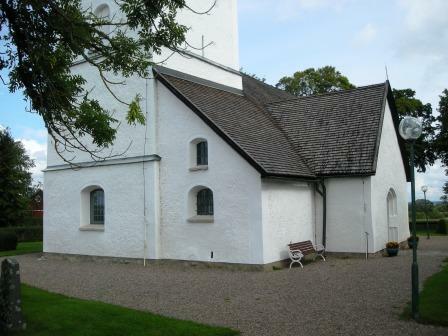 The southern entrance door is from the 12th century and one of the oldest in Östergötland. 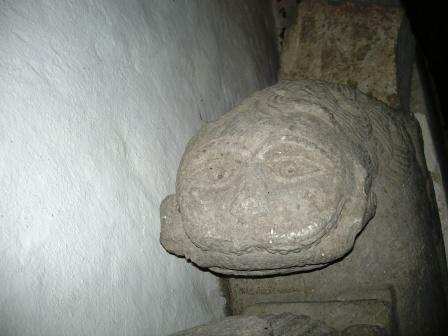 A lion holding a man in his mouth, it has probably been part of the original south gate. 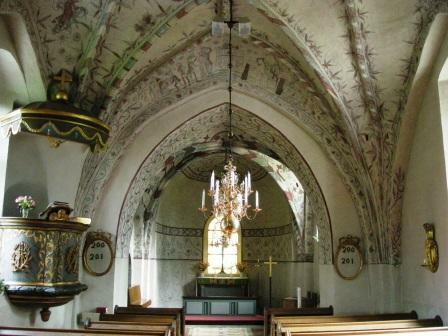 The paintings visible in the church are from the 15th century. 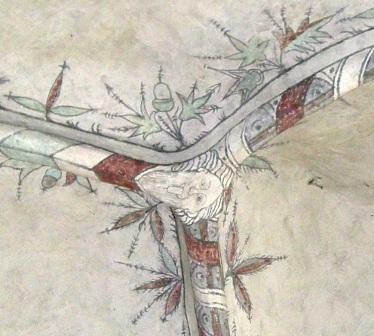 There are also paintings from the 12th century but these can only be seen from the church vind. That’ll be for another time. In conclusion a great day with great stops, in Östergötland county is lots and lots to see for those who are interested but the lack road pointers probably makes many miss them and the lack of good information signs at the sites is a loss for those who happens to stop at them.